In 2009, we developed Japan’s first Professional IP Radio System called “Voice Packet Transceiver”. We integrated VoIP technology with radio using packet switching of the 3G mobile telephone network. Unlike conventional radio systems, our system is using the mobile telephone network, so we can make calls available across the country. Our system rarely has dead zones, even between mountains and buildings. Our system is used in various business fields such as taxis and the logistics industry. More than 118,000 units are in use (Dec. 2018). 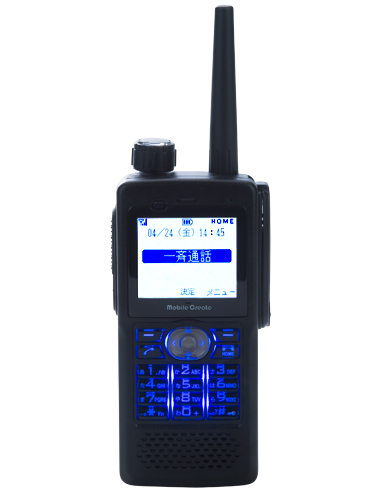 We are also able to supply this radio system world-wide by connecting to the mobile networks in each country. We will begin our overseas service in 2016. There are some areas where normal radio systems don’t work well such as outside of the radio wave area, between buildings, and inside tunnels. If the radio system doesn’t work when you need it, your business might stop, miss opportunities, or you might cause trouble to your customers. Voice Packet Transceivers can be connected to each other across the country wherever there is a mobile telephone network. Even in times of disaster, our radio system can reliably connect because we use the packet switching network which, unlike the telephone service, is usually free from regulations. Our system can be used in taxis on standby between buildings, buses and trucks in deep mountain trails, events such as marathons, natural disasters such as earthquakes, floods, etc. Try the Voice Packet Transceiver and experience the “reassurance of being connected”. When you bring a professional radio system into your business, opening the base station and network infrastructure are big obstacles because you need a licensing application to use and operate the radio. Voice Packet Transceiver is totally different from conventional radio systems even though it looks like a radio system and is called a transceiver. However, by using the mobile telephone network, Voice Packet Transceiver doesn’t require a license, base stations or special network infrastructure. The only thing you need is our device. Our system is easily used for even a short time, and is perfect for customers who were hesitant before because of licenses and applications. In other words, is this a cell phone? The Professional IP Radio System “Voice Packet Transceiver” combines a wide variety of calling modes used in mobile telephone networks and professional radio systems. Talk to all of the radio stations at once. Call from a specific mobile station to the dispatch center. This is used when you don’t want to talk other mobile stations. Individual calls are available using a standard multi-function microphone. When other radio stations are calling, usually you can’t participate in the session. However, using a device with the proper authorization settings, you can “break into” a conversation. Which Professional IP Radio System should I choose? Chosen by many customers as the pioneers of the Professional IP Radio System. In November 2009, we were the first company in Japan to develop and commercialize the Professional IP Radio System “Voice Packet Transceiver” which combines the benefits of both mobile phones and professional radio systems. Over 118,000 units are in use (Dec. 2018.). We offer a complete one-stop service, including system development, manufacturing, sales, network service and maintenance. Because we are involved in all the processes, we are able to provide the best quality and performance customers need by incorporating customer feedback directly into our products. We can also quickly address any problems or questions that arise. Professional IP Radio System makes your business to grow. 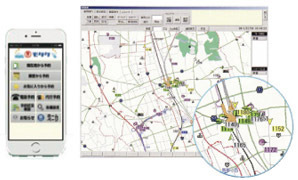 Voice Packet Transceiver is integrated with our various systems such as the location management system, taxi dispatching system and bus location system. Therefore the Voice Packet Transceiver can be used not only to make voice calls but also for many other tasks such as increasing business efficiency and safety improvement. Our Professional IP Radio System enables your business to perform better, safer and on a larger scale. The Professional IP Radio System is using a telephone company’s mobile network system. Since the base stations of the mobile network system are set up all across the country, the Professional IP Radio System covers a larger area for calling compared with conventional radio systems. Through the use of packet switching, the Professional IP Radio System can send more than just voice information. So, the Professional IP Radio System offers many convenient functions which conventional radio systems don’t have. As an MVNO, Mobile Create uses rented lines to offer convenient services to meet your needs. The device supports DC12V and DC24V power supplies. The multi-function microphone has a built-in equalizer for speaker output, and sound quality can be adjusted and made clear via low cut filtering and sensitivity control. It is packed with useful functions. By using the integrated location management and taxi dispatching systems, your business opportunities will grow with the Voice Packet Transceiver. A step up from the MPT-200, the MPT-H1 is a handy type Professional IP Radio System. The MPT-H1 has water-proof and dust-proof functions, built-in GPS and a compact body. The built-in battery works about 9 hours in normal mode and about 13 hours in power saving mode. The built-in GPS enables the use of the MPT-H1 with the location management system. It works better than other systems in places like disaster and construction sites. The MPT-200 is a handy type transceiver with a built-in battery. There is no need to apply for a license and no installation work is required. The MPT-200 has various functions to support your business. It can use All call, Individual call, Group call and Break-in call. It can be used for about 9 hours with a “lithium-ion battery”. 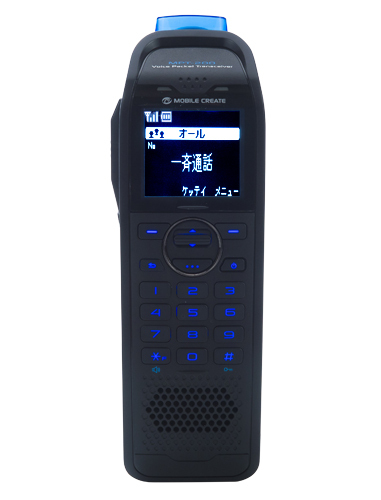 Many companies in Japan chose our Professional IP Radio System “Voice Packet Transceiver”. Since our system uses the mobile telephone network, the initial investment cost is much lower because it doesn’t require the setting up of base stations or antennas. Also, our system has fewer dead zones than conventional radio systems, and our integrated “taxi dispatching system” makes your business more effective as it specifies the location and allocates taxis efficiently using GPS functionality. The Professional IP Radio System is the best for operation management because the “Operation manager” and “Driver” can talk directly. Since you can call anywhere in the country, you can talk to the driver even when the bus is moving on highways. Our system will contribute to a safer society such as reducing crime prevention by using break-in calls in emergency cases. You can see the location of your moving trucks right from inside your office. You can also control the timing of shipping and orders. The various calling modes such as Individual call, Group call and All call, are useful for controlling the vehicles. Our system is useful not only for controlling shipping but also for sharing traffic and road accident information. The Voice Packet Transceiver has two types of devices: Mobile and portable. You can choose which device is suitable for you. Because it’s available across the whole country, many local towns and companies use our system for BCP (Business Continuity Plan). For example, Nakatsu city in Japan started to use our system after a flood to build a wide area communication network. Security companies require certainty and the Voice Packet Transceiver can connect reliably even during emergency situations. The portable type MPT-H1 has a compact body, is water-proof, dust-proof, and has built-in GPS, so you can use it outside. Combined with the location management system, you can effectively handle emergency situations. Large area support and various calling modes are useful for events held in multiple places and large sites. Even staff can share information and give instructions more easily using Group call, All call and Break-in call. With the optional MPT-H1 earphone microphone, you can even talk hands-free, thus increasing your productivity. The Professional IP Radio System “Voice Packet Transceiver” can make voice calls. Combined with location management and electronic payments, so many things are possible. You can bring big innovation to your business. This system is useful for transportation and shipping businesses. Both installation and running costs are low. By installing a GPS antenna in the vehicle, it can track the vehicle location and driving conditions, making vehicle operation more effective. It can also display location and history on a map, which can be used as proof of delivery for clients or help guide drivers along safe roads. Mebaroke is a useful system for improving your business through better transport efficiency and safety control. 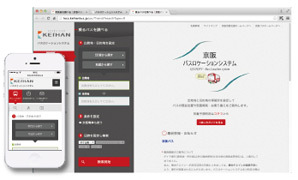 “Shinshirei” is an effective system with dispatching and location management. It shows customer details instantly when you receive a phone call, and automatically dispatches with the press of a button. It selects the closest vehicle automatically, and makes the operator’s work easier. Shinshirei makes your business more efficient by analyzing data such as the history of every vehicle. This system has real time location management for buses. It provides information about location and bus conditions to the manager and customers. It is also useful for the manager to know the driver’s location and collect data such as daily driving reports. Mobustation reduces customer waiting time through real time delivery of bus locations. You can access the information which Mobile Create manages on the customer’s device directly through the website. Using the information the data linking API offers, systems integrators can develop other systems too. * API is an abbreviation for Application Programming Interface, which is a set of public functions that other applications can use. The external device connection service uses the data of the external devices connected to the Professional IP Radio System “Voice Packet Transceiver”. It’s possible to communicate among the external devices which are connected to the Voice Packet Transceiver. By using the data linking API service, it’s possible to integrate an external client system with the Web-API. What is an IP Radio System? 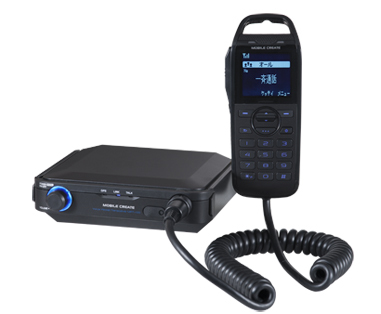 It’s a radio system that takes advantage of both conventional radios and cell phones. Since our system is using the mobile telephone network, it’s possible to communicate anywhere within the network area. It also has unique functions such as All call and Group call. Because the system doesn’t require a radio license, the initial investment cost is low. How is it different from a conventional radio? The communication area is the whole country and no license application is required. Also, no special network infrastructure or maintenance are needed. What are the advantages over cell phones? The cost is low and it is legal to call while driving when using an Mobile type device. Also, one device can talk to multiple devices simultaneously. What are the advantages of using the Professional IP Radio System “Voice Packet Transceiver”?